As some of you may already know Target is my favorite place ever. I would literally go to Target everyday to browse the deals and clearance sections if I had the time. 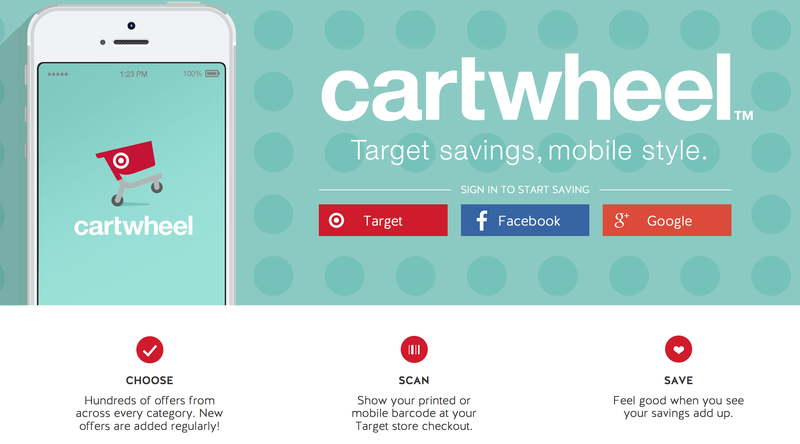 This post is about how to use the Target Cartwheel app. It’s an easy app that you can download directly from the app store and onto your phone. Once you’ve downloaded the app onto your phone you will need to create an account. I prefer to link everything directly through my Facebook (I always toggle the settings so that apps do not post on my behalf) because it is one less username and password to remember. When you’re signed in the first thing you will see is your personal barcode. If you click the three lines on the top left it will bring you to the menu screen. Click on Offers –> to begin browsing current offers by category or simply look at all offers. You can choose to look at offers based on “Newest”, “Discount”, “Trending”, or “Expiring”. Each header is self explanatory. Once you have clicked into a category or chosen all offers you can begin to add things to your barcode. Tap an item that you like once and click “add” to add it to your barcode. If you add an item by accident you can remove it by clicking “remove”. For You – displays offers that are supposed to be geared towards things you are interested in. These offers do not usually relate to anything that I would like to buy. But that may be because I add anything to my barcode that looks like a good deal. Friends – shows all of your friends who are using the app (I believe this only shows up if you are linked to Facebook). This allows you to see all of your friends ranked based on their total savings. If you click on an individual person you are brought to their dashboard that allows you too see: number of offers redeemed, friends, and total savings. As well as everything they currently have added to their barcode. Click on Collections –> to see offers split into categories. Some of the offers showing on my screen currently are “Yard Line Dining”, “Hot Deals”, & “Weekly Ad”. Click on Scan Product –> This prompts a barcode reader to pop up. I would suggest that you scan each product that you think applies to a Cartwheel offer (every item you pick up if you want to make sure that you are not missing any deals). This ensures that you are picking up an item that actually corresponds to a Cartwheel offer. Just like using coupons sometimes the terms are unclear and it is difficult to know if you will be saving money on the product you have picked up. Click on My Barcode –> This is your personal barcode that compiles all of the offers that you had added. You will need to have the cashier scan it in order to redeem your offers and save money. One thing that is really awesome about this app is that it is stackable. You can use a Cartwheel Offer, Target Coupon, Manufacturers Coupon, and Red Card savings (if you have a Red Card). This info graphic that I found on thekrazycouponlady.com is a great explanation of how your savings can stack up on a single product.